Rightfully known as "The Land of Pagodas", Myanmar is perhaps most famous for its Pagoda-studded skyline. The port city and former capital of the country - Yangon - has not one, not two, but three large pagodas which would make any shutterbug feel like a kid in a candy store. The name Yangon is both beautiful and poignant - it literally means "End of Strife" in the Burmese language. The Sule Pagoda gleams in the searing heat and humidity of Yangon. The busy, incessant traffic moving around the roundabout never seems to stop. 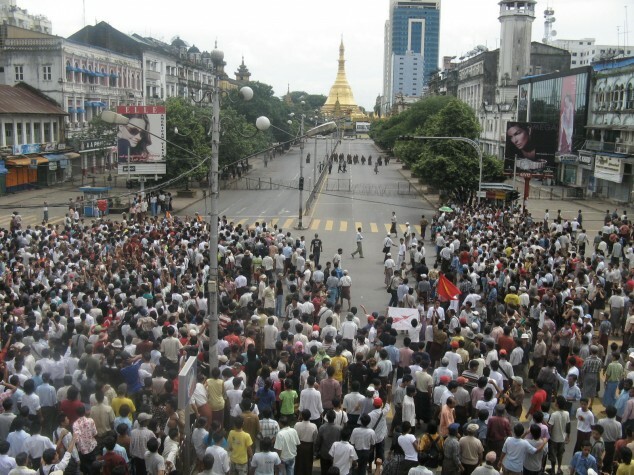 Yangon was the capital of Myanmar right up until 2006, where the military junta moved the capital up north in Central Myanmar. A few months after shifting, they named the new capital Nay Pyi Daw or City of Kings. While the pagodas themselves are a worthy subject for photographers, it is their grand old age, rich history and the fact that they are all spectacularly made out of pure gold which make them so much more mystical and yet stunning at the same time. The Sule Pagoda, visible in this bird's eye view of the city, was designated as the centre of Rangoon during British rule. Standing in a busy roundabout right smack in the middle of Yangon, the Sule Pagoda would surely be one of the first few fascinating sights a visitor would see when he travels to downtown Yangon. The Sule Pagoda has to be one of the most, if not the most, beautiful roundabouts in Southeast Asia. The only other worthy adversaries I can think of would be the similarly majestic Tugu Selamat Datang (The Welcome Monument) located at the Bundaran Hotel Indonesia ( Hotel Indonesia Roundabout) in Central Jakarta or the Fuente Osmeña Circle in Cebu. The Sule Pagoda is located in close proximity to other major important buildings, such as the Supreme Court of Burma, the Yangon City Hall and the Independence Monument, and rightfully so too, considering that it was the single most important landmark which the British used during their planning of the city. In 1852, the British overran Burma with overwhelming forces during the second Anglo-Burma war, subsequently announcing the annexation of Lower Burma. This was around the same time when the British anglicized the name of Yangon to the name most people commonly know the city as - Rangoon. In fact, while the British were redesigning the city based on a checkered street design by military surgeon, Dr. William Montgomery, Lt. Alexander Fraser - an engineer by training and a member of the Bengal Engineers, used the prominent Sule Pagoda as a landmark during his city planning in the 1880's. Lt' Fraser religiously adapted Dr. Montgomery's ideas to include a comprehensive drainage system to alleviate flooding, which was common in Yangon at that time. Fraser Street, now known as Anawrattha Street and one of the main thoroughfares of Yangon, was named after Alexander Fraser. 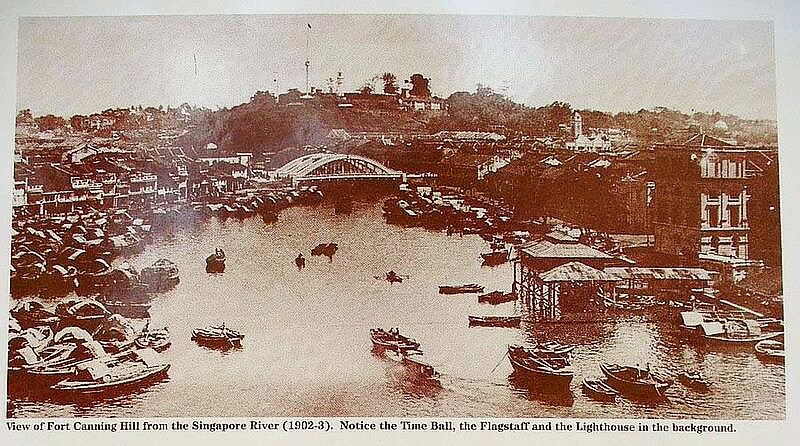 He is also known for creating layouts for wharfs, docks and cantonments at Moulmein (present day Mawlamyine, a city southeast of Yangon) and Rangoon, and was also involved in the early city planning of Singapore city. He was to be promoted to the rank of General later on in his career. Similarly to the rest of their colonies in Indian and Malaya, the British built major roads and a railroad system connecting the different townships of Rangoon, and the city of Rangoon itself to the rest of Burma. There were also built river steamers that ran between the colonial capital of Rangoon and the royal capital of Mandalay, which the British eventually annexed into part of the Burmese colony much later. A similar justice system to that of Britain was imposed and the British created Insein prison (near to Rangoon), an active prison which is still used today to house prisoners. On the flip side, the British brought electricity, improved sanitation, and hospitals to Rangoon. The Supreme Court of Myanmar can be seen from Sule Pagoda. A flag of The Union of Myanmar flutters proudly away in the afternoon breeze atop the Clock Tower of the Supreme Court. A beautiful sight - the Supreme Court is just a stone's throw away from Sule Pagoda. Under the scorching Burmese sun, the golden pagoda beams with much aplomb. Shops peddling everything from religious relics to services such as fortune telling and other whatnots, line the circumference of the pagoda, while in the inner ring, 10 bronze bells surround the large golden dome, known in Burmese as a Chedi. While the Chedi, which is 48 metres tall and topped with a golden spire, may not be the tallest among the three pagodas in Yangon, it unquestionably dwarfs the nearby colonial buildings which were built much later. The gleaming surface of the pagoda is generously plastered with new pieces of gold leaves every now and then, either as a mark of devotion or the donation of a devotee who has had his or her prayer(s) answered, adding on to the splendour of the ravishing golden facade. The Sule Pagoda is said to be around 2500 years old and built during the time of the Buddha, before the magnificent Shwedagon Pagoda was erected. It is believed that the Chedi contains a single strand of hair given by Buddha to two traveling Burmese trader siblings - Tapissa and Balika - who subsequently enshrined the hair and erected the pagoda at its present location. Yangon City Hall - located just across the street from Sule Pagoda - underwent a fresh paint job recently. It used to have a yellow facade. I'd say white suits it better. Each and every corner of the octagonal monument contains an altar which in turn represents a day of the week. Worshipers bathe their corresponding buddha statues in the altars with water. So, if you were born on a Monday, you'll have to go to the correct buddha statue and bathe it with water for good luck. I know you'd be asking why there are 8 altars instead of 7 in this case. That's because the Burmese traditionally believe in having 8 days a week, whereby Wednesday is divided over two days. Although it is a serene place for meditation and devotion, the Sule Pagoda witnessed 2 unfortunate episodes of insurgence against the government and bloodshed during the 8888 uprising (the demonstration was held on 8 August 1988 - hence the name) and more recently, during the 2007 Saffron Revolution, where fuel prices were exponentially increased without rhyme or reason, giving rise to a series of demonstrations led by Buddhist monks. The name was given due to the saffron coloured robes worn by the Buddhist monks. Of course, in the present day, the situation is much more peaceful. On a regular day, numerous touts circle the outskirts of the pagoda looking to make a quick buck either through offering illegal money changing services, or peddling polythene bags for a nominal fee. You must be wondering what are the bags for. Well, when you enter the pagoda, you'll need to take off your shoes. Many tourists have returned to the entrance where they left their shoes only to be frustrated by their shoes being stolen. Hence, many entrepreneurs have started selling bags which you can store your shoes in and carry them around without any worries. Outside the pagoda, you can also find many people buying maize or other forms of bird-seeds to feed wild pigeons. This is seen as an act of piety for all living creatures, in addition to abstinence from meat and poultry. This makes certain areas unsafe for walking since pigeons like to roost on overhead power cables and create a "drop zone" of their own! This article is part of a two-part series on the Sule & Shwedagon Pagodas. Work is currently in progress on the article on the magnificent Shwedagon Pagodas and will be uploaded as soon as it are completed.